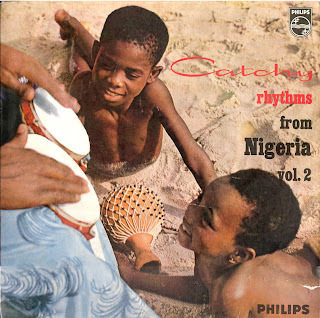 A few days later than I had hoped, here is the second volume of "Catchy Rhythms from Nigeria". Unlike many volume 2's this is at least as good as the first. For one thing, it has two more songs than volume 1. And it has three songs by one of my favourite highlife artists: Victor Olaiya. And great songs they are too. You may remember my earlier posts of some tracks of this great Nigerian star (and if you don't, I advise you to make up for this oversight a.s.a.p.). The three tracks on this 10 inch lp are of at least the same quality. My favourite of the three is "Mumude", a near-perfect masterpiece. But "Omolanke" and "Cool Cats' Invitation" are in the same top class of highlife music. There is lots more to enjoy in this volume. For one there are the Ishie Brothers with two songs (one Ibo and the other Hausa) in a very different, but also superb - guitar, banjo and cigarette tin (!) based - style. 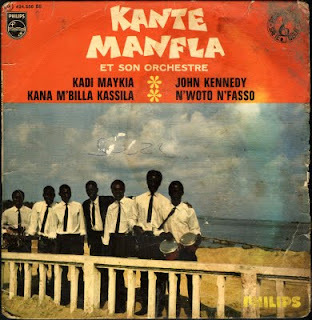 Of the remaining five tracks I would like to mention Julius O. Araba, who also featured on the first volume, and Ganiya Kale and his 'Guinea Mambo Orchestra' (love that name) with a track that suggests a connection with apala music. But this may be due to the use of the agidigbo (which was also used in apala music). And then there is Sammy Akpabot ("well-known from radio and films" - I wouldn't be surprised if this, and this, was the same guy! ), whose advice to "save for a rainy day" seems somewhat dated in view of the instability of the present-day banking system. The two remaining songs are both sung by Joe Nez, "The Voice of Nigeria" according to the informative sleeve notes. Personally I have some doubts about this label; and I will even go as far as stating that the song of Joe and his own Trio (with a piano player who only plays two notes*) is the least interesting of this collection. The one with 'Baby-Face' Paul and his 'Top-Toppers' is enjoyable for the orchestration. If you start the new year with this album you can't go wrong. * and you have to listen very hard to hear them. With the release of yet more compilations of Franco's extensive repertoire it may seem amazing to some that there are still plenty of songs that have not been published in digital form. And I am sure you will be even more amazed when you hear the quality of some of these compositions. 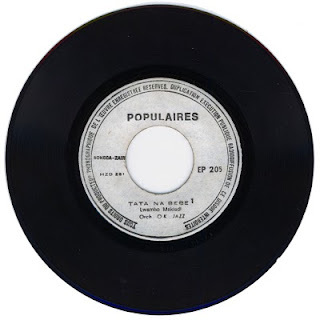 In this post I would like to share three singles with you, all from what many consider to be Franco's heyday. Personally I am more inclined to believe that Franco's whole career existed of one big heyday, or at least an impressive series of peaks. The particular heyday I am referring to started more or less when Sam Mangwana joined the O.K. Jazz. A lot has been written about this move, and I will post Sam's own views about this at a later date. For now, I would like to stick to the music. The first of these singles is from 1973. On the A-side is one of the earliest tracks of Mangwana with the O.K. Jazz, "Cedou". Remarkably he is only present as a backing vocalist in this composition by rhythm guitarist Lutumba Simaro (whose compositions* were crucial to the evolution of the O.K. Jazz in this turbulent period). 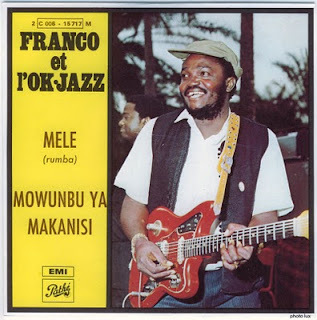 The leading vocals are by Michel Boyibanda and Franco, and Lola Djangi 'Chécain' is present in the background. But Mangwana's contribution is nevertheless impressive, and certainly meant a shift towards a more melodic style for the O.K. Jazz. Franco's own intentions in this respect are illustrated by the B-side, "B.S.K.". A brilliant bolero sung by Franco himself, accompanied by the full horn section of the Tout Puissant O.K. Jazz. I hope someone can explain to me why this masterpiece has never been digitized. Note, by the way, that Franco did play this song in a concert in Amsterdam in January 1989. The second single is from 1974. "Mele", the A-side, was composed by Chécain, who was seen by his colleagues as the main representative of the 'old' style of the O.K. Jazz. In my opinion it was a stroke of pure genius to combine the voices of Mangwana and Chécain, and this is probably one of the best examples of this golden combination. Chécain sings the 'seconde', i.e. the lower of the two vocal parts which adjusts to back the main melody of the song. He has a rather sad, but slightly dry and understated singing style, while Mangwana's voice soars and flows with the melody. To me, Chécain's backing turned Mangwana into an O.K. Jazz style singer. As Mangwana prepares for the solo, Michel Boyibanda comes in to support Chécain. But some echo is put on to his vocal, adding distance to his singing, while Chécain remains in the foreground. Trumpets come blaring in and Sam launches into his solo. After just over four minutes Franco takes control and leads his orchestra into a full-force climactic finale. It is not surprising that Chécain had a preference for working with Mangwana in his compositions, e.g. in "Lukika" (which is sometimes incorrectly attributed to Franco) and the 1975 track "Toboyana Kaka". The B-side, "Mowunbu Ya Makanisi" (titled "Bano Brekete" on the Kenyan release "In Memoriam Vol. 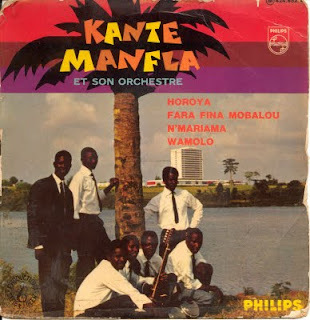 9"), was a song composed by Franco, and is sung by Franco himself and Youlou Mabiala, who had already ventured outside of the O.K. Jazz, but had returned (and would soon leave again). The song starts off in a rather conventional old style O.K. Jazz manner, but after almost two and a half minutes breaks into rather unusual solo by Franco, in which he almost hammers the chords. The third record of this post, "Tata Na Bebe 1 & 2", is one I posted earlier, but in a different setting. And, on closer study, I have changed my mind about the dating of this song. The use of four vocalists and the guitar sound are indications it must be from 1974. The song opens with two rounds of solo vocals by (in this order) Sam Mangwana, Josky Kiambukuta, Michel Boyibanda and Franco, followed by two more rounds in the same order, but with a chorus filling in the gaps. At the end of part one, Franco is about to steer the orchestra into a rousing, nose-down, kamikaze style sebene. This also means that the first two and a half minutes of part two are a copy of the last two and a half minutes of part one (you can check this if you like...), and the recorded track lasted less than seven and a half minutes (the result of joining the two unique parts can be found here). This is, by the way, not unusual for tracks from this period. My impression is that this was due to the technical limitations I wrote about in an earlier post about Haruna Ishola (who was the co-owner of one of the most advanced recording studios in Africa). Getting back to the subject of digitizing Franco's oeuvre, only one of the five** tracks in this post has been released on CD. The four other tracks seem essential to the understanding of how the O.K. Jazz became the Tout Puissant O.K. Jazz, - while staying O.K..
* "Ebale Ya Zaire", "Mabele", "Minuit Eleki Lezi" - to name just three. ** counting the two parts of "Tata Na Bebe" as one. EDIT July 7, 2016: all three singles in one file. This post is about goosebumps. This is what I get from visiting http://nikiibu.wordpress.com/, a site dedicated entirely to Salia Koroma, a Mende accordionist from Sierra Leone. I can only bow to so much thoroughness. I have nothing to add to this site except this cassette which I copied from a friend who visited Sierra Leone in the 1980s. The cassette does not have a title, only "Salia Koroma # 40". As an illustration of nikiibu's thoroughness I add a video borrowed from his/her site. For others, and for more of and about Salia Koroma I humbly refer you to http://nikiibu.wordpress.com/. EDIT June 11, 2013: The link has been renewed. This record should get you in the right spirit for Christmas. It is the first of two volumes; the second will follow in a few days. This volume features Nigerian highlife legends like Bobby Benson, Steven Amechi (both with two songs) and Julius (J.O.) Araba. There are only eight songs on this 10 inch lp, but all of these are great. 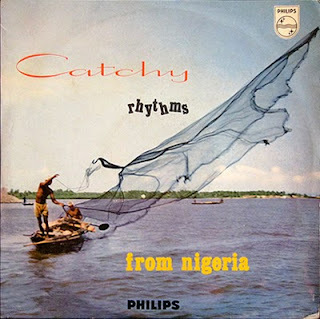 There is plenty of variety too, from the more typical English/pidgin nightclub songs like Bobby Benson's evergreens "Taxi Driver" and "Gentleman Bobby" and the brilliantly dated "Nylon Dress" by Steven Amechi to the more juju-like "Iyawo ma pa mi" performed by Julius Araba and his Rhythm Blues and the dramatic "Ariwo" of Chris Ajilo and his Cubanos. Personal favourites are the two songs by Steven Amechi and his Empire Rhythm Skies, and especially "Igbo konnga". Great music for winding down and mellowing out to the good-will-to-all-mankind level required for a Happy Christmas. PS: the scan of the back of the sleeve is rather poor and illegible. I would be grateful if someone (anyone) could supply us with a better, readable copy. UPDATE: Jan has sent a very readable scan of the backside of the sleeve. The scan can be found here. 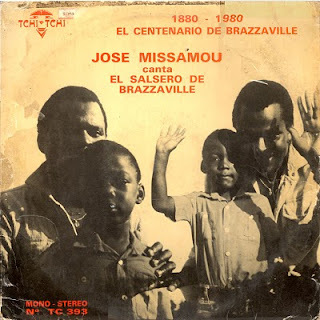 Not too long ago I stumbled upon a CD by Jose Missamou called "El Salsero De Brazzaville a Cuba". Going by the titles I was tempted to assume this was a digitization of an lp which over time has grown on me. Luckily I had the good sense to listen to the CD before making the error of buying it. And by this I don't mean the CD is rubbish. It's okay, - but not as good as the lp. And neither is it a digital version of this unique lp. The lp "Jose Missamou canta El Salsero de Brazzaville" is unique for various reasons. The first, and most obvious, is the incredible hyperspace sound. Echoing horns, ringing piano: this is not one of the many prefab NY, Fania-style productions! And then there is the presence of a backing vocalist of great repute: Ntesa Dalienst, of T.P. O.K. Jazz, Grand Maquisards and Vox Africa fame. A gentle man among gentlemen, one of the most likeable personalities in Congolese music, - who regretfully died in 1996. Jose Missamou is also, unfortunately, no longer with us. He died almost exactly 10 years ago, on December 22, 1999, at the age of 55. As far as I have been able to ascertain, the partnership between Missamou and Dalienst only lasted two albums. The other album is titled "Ritmo de Africa" and is probably from the same period. I hesitate to suggest it may be from the same recording session, mainly because the horns are less spacey than on "El Salsero". Zooming in on the songs a few songs stand out. On both "Ritmo de Africa" and "El Salsero" Ntesa partly takes over the lead vocal in one song. One of these, "Mi Historia", some of you may recognise from Ntesa's concerts with the 1990s version of Les Maquisards (of which I may be tempted to post some tracks later). On the other songs Ntesa's contribution is more modest. In "Dame Un Papel" Missamou calls out to Wuta Mayi (T.P. O.K. Jazz, Quatre Etoiles, etcetera). I suspect he is the second backing vocalist (but only on "El Salsero"). Remarkable too is Missamou's relatively good command of the spanish language (compared to - for example - Laba Sosseh). He has, I am told, travelled to Cuba, and even has performed for Cuban audiences. 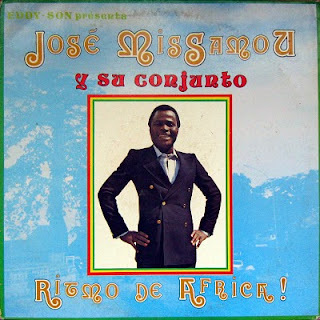 Jose Missamou has also made some more typically Congolese records, but I must admit I have never (consciously) heard any of these. Maybe someone is willing to share these with us? Anyway. It's all working now (<knocking on wood like an idiot>), so let's get on with it. 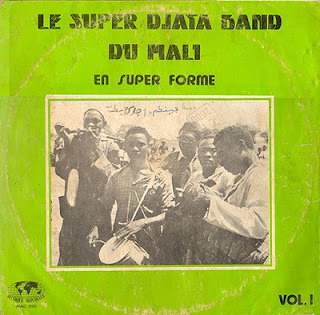 Although the Super Djata Band (see earlier posts) has covered songs from other artists (for example Coumba Sidibé's "Yamba", Abdoulaye Diabaté's "Massa Djourou" and Bazoumana Sissoko's "Yiriba") most of their songs are based on traditionals from the Sikasso region. The track "Batila" (which on a later album was misinterpreted as "Bandjila"), for example, is based on a song performed by an uncle of Alou Fané. This uncle lived in a village about 70 kilometres from Sikasso where he was a regionally renowned balafon player, with links to the local komo circle. In the case of "Sisse Na Djolo" a connection on a personal level too is at the basis of the selection. The song was composed by Na Hawa Doumbia and had been interpreted by her at the Biennale a few years before. She and her husband N'Gou were good friends of Daouda 'Flani' Sangaré and - like Flani's eldest son - living in Bougouni. 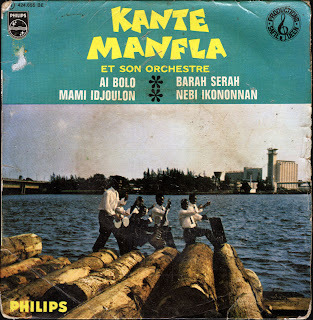 Of the two other songs on this album, which was released in the early 1980s (1982, according to Graeme on RadioAfrica) in Abidjan, "Nama Djidja" is in the typical Djata Band style, with lyrical references to several donso ngoni classics. Note the part where Flani names the musicians and the percussionists respond with a small solo. It's the first song of this album that has caused some controversy. Some of you may recognise "Fongnana Kouma" from the version by National Badema with that great singer Kassemady Diabaté (and if you don't know this, please let me know and I'll be glad to post it later). 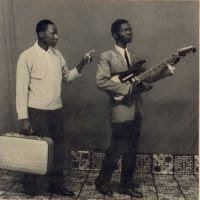 Although it may not sound like a track from the Djata Band repertoire, both Flani and Zani Diabaté have assured me it is. Similar claims have, however, been made by members of the former Badema. Personally I have fond memories of this song. The first time I heard it was sleeping in a hotel in the centre of Bamako. I had some difficulty sleeping after I had spent the whole afternoon searching for Flani, who I later heard had travelled to Abidjan. Through the noise of the traffic (which also contributed to my insomnia) I kept on hearing the same Flani singing this wonderful, haunting song. In my semi-conscious state it seemed like the song went on for ever, but after a few hours it dawned on me they were repeating the cassette. So I decided to record it (this recording can be found here). As before I have two versions of this lp, a cassette version (which I bought a few days later in Bamako) and a copy of the lp (which I copied years later). The cassette version of "Nama Djidja" is (for reasons only known to the producer of this cassette) shortened by almost a minute. The balafon player, by the way, is Zani's late brother Bakari. As you may have gathered, I am quite a fan of modern traditional music styles, and not just the ones from Mali, but certainly also the many different and at times distinct styles from Congo. I like bands like Konono No.1, the Kasai All-Stars and such (although they have a tendency to get a little less unpretentious with their exposure to western audiences), but I am convinced there are many more established local heroes that have remained undiscovered by western explorers. About a year ago I dedicated a post to one of these, Debonheur, a strong defender of his Kikongo roots. Roots which he shares with this wonderful artist: the (self proclaimed?) 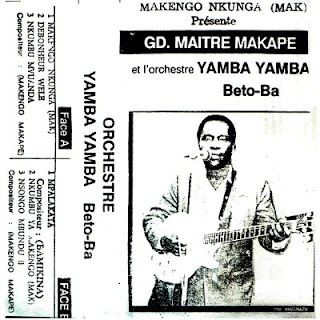 Grand Maître Makengo Makape and his orchestre Yamba Yamba Beto-Ba. If, like me, you are in need of a shot of musical 'pep' in these hectic pre-Christmas weeks, I advise you to shove this in your mp3 player. Nearly 45 minutes of pure guitar-propelled energy of the type that you will find very hard to resist! WARNING: do not play this music when driving on wintry roads!